On Friday 26 April 2019 from 14h00 to 16h30. On Saturday 27 April 2019 from 14h00 to 17h00. Il faut être membre d'Eneo et une participation aux frais de 2 € est demandée par séance. On Saturday 25 May 2019 from 10h00 to 18h00. On Thursday 11 April 2019 from 18h00 to 20h30. On Tuesday 9 April 2019 from 17h15 to 20h00. On Tuesday 9 April 2019 from 14h30 to 18h30. On Sunday 7 April 2019 from 16h00 to 17h30. On Saturday 6 April 2019 from 17h30 to 22h00. On Saturday 6 April 2019 from 11h00 to 12h30. From Saturday 6 April 2019 at 09h00 to Sunday 7 April 2019 at 18h00. On Friday 5 April 2019 from 19h00 to 21h00. On Friday 5 April 2019 from 15h45 to 18h15. On Thursday 4 April 2019 from 20h00 to 23h59. On Thursday 4 April 2019 from 20h00 to 21h45. On Thursday 4 April 2019 from 18h00 to 20h30. On Wednesday 3 April 2019 from 15h00 to 17h00. On Wednesday 3 April 2019 from 13h30 to 17h30. From Wednesday 3 April 2019 at 10h00 to Saturday 6 April 2019 at 17h00. On Tuesday 2 April 2019 from 18h30 to 21h00. On Sunday 31 March 2019 from 14h00 to 17h30. On Sunday 31 March 2019 from 10h30 to 13h00. On Saturday 30 March 2019 from 15h00 to 17h00. On Saturday 30 March 2019 from 14h30 to 18h30. On Saturday 30 March 2019 from 14h00 to 19h00. From Saturday 30 March 2019 at 14h00 to Sunday 31 March 2019 at 01h00. On Saturday 30 March 2019 from 14h00 to 18h00. On Saturday 30 March 2019 from 10h00 to 12h30. On Saturday 30 March 2019 from 09h30 to 10h00. Kergrist-Moëlou Journée de rencontre "Le numérique, ça nous regarde !" On Saturday 30 March 2019 from 09h30 to 16h30. On Friday 29 March 2019 from 20h00 to 22h00. On Friday 29 March 2019 from 18h00 to 20h00. On Friday 29 March 2019 from 18h00 to 23h00. On Friday 29 March 2019 from 17h00 to 18h00. On Friday 29 March 2019 from 16h30 to 19h00. On Friday 29 March 2019 from 14h00 to 16h30. On Friday 29 March 2019 from 14h00 to 16h00. On Friday 29 March 2019 from 14h00 to 20h00. On Thursday 28 March 2019 from 19h00 to 21h00. L'Ile d'Yeu Dégooglisons Internet ! On Wednesday 27 March 2019 from 20h30 to 22h30. On Wednesday 27 March 2019 from 19h30 to 23h30. On Wednesday 27 March 2019 from 18h30 to 20h00. On Wednesday 27 March 2019 from 14h30 to 17h00. On Wednesday 27 March 2019 from 13h30 to 18h30. On Wednesday 27 March 2019 from 13h30 to 17h30. On Wednesday 27 March 2019 from 10h00 to 12h00. On Tuesday 26 March 2019 from 20h30 to 23h00. On Tuesday 26 March 2019 from 18h30 to 20h30. On Tuesday 26 March 2019 from 18h00 to 20h00. On Tuesday 26 March 2019 from 17h00 to 20h00. On Tuesday 26 March 2019 from 16h30 to 18h00. On Tuesday 26 March 2019 from 12h30 to 13h30. From Tuesday 26 March 2019 at 10h00 to Sunday 31 March 2019 at 18h00. On Monday 25 March 2019 from 19h00 to 20h30. On Monday 25 March 2019 from 19h00 to 21h00. On Monday 25 March 2019 from 17h00 to 20h00. From Monday 25 March 2019 at 10h00 to Friday 5 April 2019 at 18h00. On Monday 25 March 2019 from 10h00 to 12h00. On Sunday 24 March 2019 from 14h00 to 19h00. On Saturday 23 March 2019 from 16h00 to 18h00. On Saturday 23 March 2019 from 14h00 to 16h00. On Saturday 23 March 2019 from 14h00 to 18h00. Gometz le Châtel Logiciels libres : pourquoi, comment ? From Saturday 23 March 2019 at 10h00 to Sunday 24 March 2019 at 16h00. On Saturday 23 March 2019 from 10h00 to 17h00. On Saturday 23 March 2019 from 10h00 to 16h30. On Saturday 23 March 2019 from 10h00 to 18h00. On Saturday 23 March 2019 from 09h30 to 17h00. On Saturday 23 March 2019 from 09h00 to 13h00. On Friday 22 March 2019 from 20h30 to 23h00. On Friday 22 March 2019 from 20h30 to 23h59. On Friday 22 March 2019 from 16h00 to 18h00. On Friday 22 March 2019 from 10h00 to 18h00. On Thursday 21 March 2019 from 19h30 to 20h15. On Thursday 21 March 2019 from 18h45 to 19h30. On Thursday 21 March 2019 from 17h30 to 18h30. Lyon Le jeudi c’est Wiki : Où sont les femmes ? On Thursday 21 March 2019 from 17h00 to 19h00. On Wednesday 20 March 2019 from 18h30 to 20h00. On Wednesday 20 March 2019 from 15h00 to 17h00. On Wednesday 20 March 2019 from 13h30 to 18h30. On Wednesday 20 March 2019 from 13h30 to 17h30. 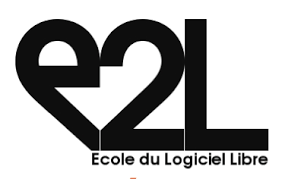 Paris Soirée fundthecode.org - découvrez des projets libres et soutenez-les gratuitement ! On Tuesday 19 March 2019 from 19h00 to 22h30. On Tuesday 19 March 2019 from 19h00 to 22h00. On Tuesday 19 March 2019 from 16h30 to 18h00. On Monday 18 March 2019 from 19h30 to 21h30. Auch Le risque sur Facebook, Google est énorme ! On Monday 18 March 2019 from 19h00 to 21h30. On Monday 18 March 2019 from 10h00 to 12h00. On Saturday 16 March 2019 from 15h30 to 19h00. On Saturday 16 March 2019 from 15h00 to 18h00. On Saturday 16 March 2019 from 14h30 to 17h00. On Saturday 16 March 2019 from 14h00 to 18h00. On Saturday 16 March 2019 from 14h00 to 16h30. On Saturday 16 March 2019 from 14h00 to 17h00. On Saturday 16 March 2019 from 11h00 to 13h00. On Saturday 16 March 2019 from 11h00 to 18h00. On Saturday 16 March 2019 from 10h00 to 12h00. On Saturday 16 March 2019 from 09h30 to 12h00. On Friday 15 March 2019 from 20h30 to 22h30. Paris Ordinateurs et environnement ; « Emmabuntüs » ressuscite de vieux ordi. On Friday 15 March 2019 from 19h15 to 20h45. On Friday 15 March 2019 from 18h30 to 22h00. On Friday 15 March 2019 from 10h00 to 17h00. On Thursday 14 March 2019 from 18h00 to 22h00. On Thursday 14 March 2019 from 18h00 to 20h30. On Thursday 14 March 2019 from 14h00 to 17h00. On Thursday 14 March 2019 from 10h00 to 12h00. On Wednesday 13 March 2019 from 19h30 to 23h30. On Wednesday 13 March 2019 from 18h30 to 21h00. On Wednesday 13 March 2019 from 18h30 to 20h00. On Wednesday 13 March 2019 from 17h00 to 19h00. On Wednesday 13 March 2019 from 15h00 to 17h00. On Wednesday 13 March 2019 from 13h30 to 18h30. On Wednesday 13 March 2019 from 13h30 to 17h30. Nanterre Emission de radio. Et si on se dégooglisait ? On Tuesday 12 March 2019 from 18h30 to 19h30. On Tuesday 12 March 2019 from 16h30 to 18h00. On Tuesday 12 March 2019 from 09h00 to 12h00. Agen Libre ??? Le risque sur Facebook, Google est énorme ! On Monday 11 March 2019 from 19h30 to 22h00. On Monday 11 March 2019 from 18h00 to 22h00. Eauze La Malbouffe Numérique, et l'Hygiène Numérique, libre. On Sunday 10 March 2019 from 17h00 to 20h00. On Saturday 9 March 2019 from 16h00 to 18h00. On Saturday 9 March 2019 from 11h00 to 18h00. On Saturday 9 March 2019 from 10h00 to 12h00. On Saturday 9 March 2019 from 09h30 to 12h00. On Saturday 9 March 2019 from 09h00 to 20h00. On Friday 8 March 2019 from 20h00 to 23h55. On Friday 8 March 2019 from 19h00 to 21h00. On Friday 8 March 2019 from 17h00 to 19h00. On Thursday 7 March 2019 from 19h00 to 21h00. On Thursday 7 March 2019 from 18h30 to 21h00. On Thursday 7 March 2019 from 17h00 to 19h00. On Wednesday 6 March 2019 from 20h30 to 22h00. On Wednesday 6 March 2019 from 19h00 to 22h00. On Wednesday 6 March 2019 from 18h30 to 20h00. On Wednesday 6 March 2019 from 15h00 to 17h00. On Wednesday 6 March 2019 from 14h30 to 17h30. On Wednesday 6 March 2019 from 13h30 to 18h30. Saint-Étienne Projection-Débat "Nothing To Hide"
On Tuesday 5 March 2019 from 20h30 to 23h30. On Tuesday 5 March 2019 from 18h30 to 20h30. On Tuesday 5 March 2019 from 18h00 to 21h00. On Tuesday 5 March 2019 from 17h00 to 19h00. On Monday 4 March 2019 from 19h30 to 21h30. On Monday 4 March 2019 from 18h00 to 21h00. From Monday 4 March 2019 at 16h00 to Friday 29 March 2019 at 17h00. From Monday 4 March 2019 at 14h00 to Saturday 30 March 2019 at 18h00. From Monday 4 March 2019 at 10h00 to Saturday 30 March 2019 at 18h00. From Monday 4 March 2019 at 09h00 to Tuesday 5 March 2019 at 18h00. On Monday 4 March 2019 from 09h00 to 12h00. On Sunday 3 March 2019 from 14h30 to 17h30. On Saturday 2 March 2019 from 16h00 to 18h00. On Saturday 2 March 2019 from 15h00 to 18h00. On Saturday 2 March 2019 from 14h30 to 15h45. On Saturday 2 March 2019 from 10h00 to 18h00. On Saturday 2 March 2019 from 09h30 to 18h00. On Friday 1 March 2019 from 18h30 to 20h30. On Friday 1 March 2019 from 17h00 to 19h00. 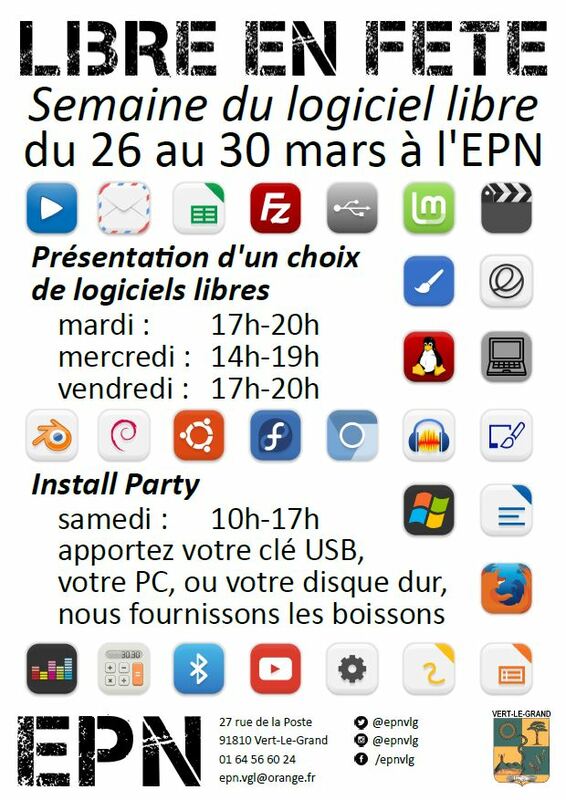 Auch Les logiciels libres, c'est quoi ? On Wednesday 20 February 2019 from 20h00 to 22h00. On Wednesday 20 February 2019 from 12h00 to 17h00.